1879 Stanley Map of East Africa Tracing His First Trans-Africa Expedition. WE SELL ONLY ORIGINAL ANTIQUE MAPS - NOT REPRODUCTIONS. Title: Map showing the Eastern Half of Equatorial Africa and the Explorations by Land and Water of Henry M. Stanley in the years 1874 - 1877. 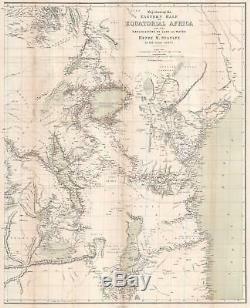 Description: This is a rare 1879 Henry Morton Stanley map of East Africa. The map depicts the region from South Sudan to Zambia and Mozambique and from the Democratic Republic of the Congo to the Indian Ocean. A study in stark contrast, Stanley's route from Zanzibar across the continent to Uzimba in the modern-day Democratic Republic of the Congo, is highly detailed. Points all along the route are labeled, including during his circumnavigation of Lake Victoria and Lake Tanganyika. Notes concerning the region's larger lakes are also included, such as their elevation above sea level and the name of the first European to'discover' each lake. However, outside of the immediate vicinity of Stanley's expedition, the map is blank, underlining the complete lack of knowledge then available concerning African geography and its people. Tribes are named, and river courses are included, but the majority of the territory depicted is left blank. Stanley's First Trans-Africa Expedition This map traces half of Henry Morton Stanley's first trans-Africa expedition, which took place from 1874 to 1877. Its stated goals were to explore Lake Victoria, Lake Albert, and Lake Tanganyika, and their inflowing and outflowing rivers, and to explore the Lualaba River downstream from its outflow. Another important goal of the expedition was to establish the source of the Nile River. Sponsored by the New York Herald and the Daily Telegraph , Stanley left Zanzibar on November 12, 1874 at the head of a column of 230 people, most of whom were African porters. By March 1875 he and his party arrived at Lake Victoria, though over sixty members of his party had died en route. Stanley spent fifty-seven days exploring Lake Victoria, and then moved on to Lake Tanganyika. He was unable to explore Lake Albert due to a war between Uganda and Wavuma. The party then began work on achieving their final goal of determining whether the Lualaba River fed the Nile, the Congo, or even the Niger. This arduous task took nearly a year, and in the end Stanley's party numbered only 115, including three children that had been born during the trip. This map was produced for Henry Morton Stanley's Through the Dark Continent; Or, The Sources of the Nile: Around the Great Lakes of Equatorial Africa and Down the Livingstone River to the Atlantic Ocean and most likely published in the first American edition in 1879. This map is rare on the market. Size: Printed area measures 33.25 inches high by 27 inches wide. Backed on archival tissue for stability. Wear along original fold lines. Some areas of infill along original fold lines. If your address is a P. Duty varies by country and we cannot predict the amount you will be charged. Some countries are duty free, others are not. Other Services Conservation Framing: Geographicus recommends basic conservation framing services for any antique paper. We do not offer this service. Antique Map Restoration: Geographicus can repair and restore your antique map. Services include deacidification cleaning flattening and backing. The item "1879 Stanley Map of East Africa Tracing His First Trans-Africa Expedition" is in sale since Friday, January 4, 2019. This item is in the category "Antiques\Maps, Atlases & Globes\Africa Maps". The seller is "geographicusmaps" and is located in 11221. This item can be shipped worldwide.